The Volumes step of the wizard is available if you have chosen to create a volume-level backup. At the Volume step of the wizard, make sure that the Device option is selected and press Enter. In the Add devices to scope window, select individual volumes or entire computer disks that you want to include in the backup and press Enter. To include individual volumes of your computer in the backup, select block devices that represent volumes that you want to back up, for example: sda1 and/or sda6. To include all volumes on a computer disk in the backup, select block devices that represent disks whose volumes you want to backup, for example: sda and/or sdb. All volumes on the selected disk will be automatically selected, too. To navigate the list of volumes and select the necessary items, use Up, Down and Space keys. To learn more, see Navigating Backup Job Wizard. If you have created several system partitions, for example, a separate partition for the /boot directory, you should remember to include all of these partitions in the backup. Otherwise, Veeam Agent for Linux does not guarantee that the OS will boot properly when you attempt to recover from such backup. At the Volume step of the wizard, select the Mountpoint option and press Enter. To navigate the list of mount points and select the necessary mount points, use Up, Down and Space keys. To learn more, see Navigating Backup Job Wizard. At the Volume step of the wizard, select the LVM option and press Enter. In the Add LVM to scope window, select LVM logical volumes or volume groups that you want to include in the backup and press Enter. 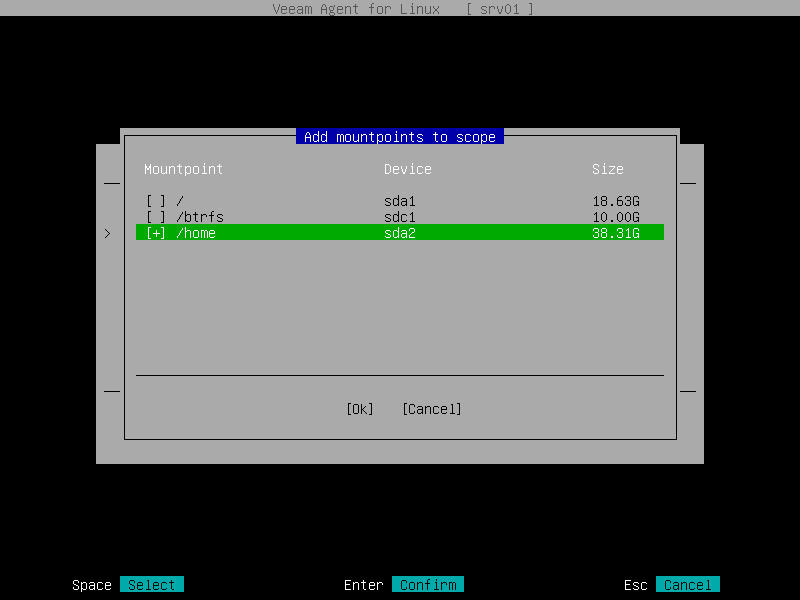 To navigate the list of LVM volumes and select the necessary items, use Up, Down and Space keys. To learn more, see Navigating Backup Job Wizard. If you include an LVM volume group in the backup, all LVM logical volumes in the selected volume group will be automatically selected, too. Veeam Agent for Linux does not back up LVM snapshots. At the Volume step of the wizard, select the BTRFS option and press Enter. In the Add BTRFS to scope window, select Btrfs storage pools or subvolumes that you want to include in the backup and press Enter. To navigate the list of Btrfs pools and subvolumes and select the necessary items, use Up, Down and Space keys. To learn more, see Navigating Backup Job Wizard. Veeam Agent for Linux identifies Btrfs storage pools by UUIDs. If you include a Btrfs pool in the backup, all Btrfs subvolumes in the selected pool will be automatically selected, too. You cannot add read-only Btrfs snapshots to the backup scope.